This is a spicy episode! To say that there was a difference of opinion about this week's film would be an understatement. 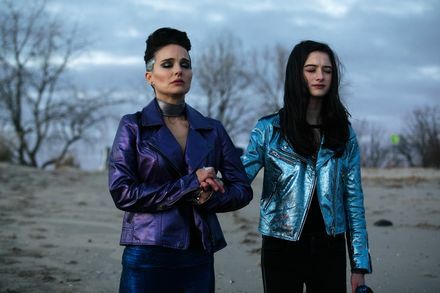 We're talking about the new Natalie Portman, popstar in crisis movie Vox Lux. The crew is joined by TV writer Jenny Jaffe ('Big Hero 6: The Series'). They answer a question from the mailbag: "What director - whose first high profile pictures were stellar - were you most surprised/disappointed to see flame out?" The Christmas season wouldn't be complete without another edition of the El Mero Mero De Navidad Christmas Minute with Alonso Duralde. And, as always, staff picks. In news, Kevin Hart steps down as Oscars host, and Sister Act 3 moves on with no Whoopi Goldberg. PLUS, we have two Spotify playlists. One is for Movie Soundtracks and the other is for Movie Scores. Check 'em out! With Jenny Jaffe, April Wolfe, Alonso Duralde, and Ricky Carmona.